September 27, 2004: If you've ever watched Star Trek, you know the importance of shields. When a star explodes or a Klingon death ray lances out of the darkness, the captain yells two words, "Shields up! ", and all is well. Deflector shields: Don't leave home without one. The solar system's deflector shield is a giant magnetic bubble called "the heliosphere." It's part of the sun's magnetic field. No one knows the precise dimensions of the heliosphere, but it's bigger than the orbit of Pluto. All nine planets are inside it. The heliosphere is important to life on our planet. A few million years ago, for instance, a cluster of massive stars drifted through our part of the Milky Way and exploded, one after another, like popcorn. Cosmic rays from the blasts were mostly deflected by the heliosphere, sparing early humanoids a radiation bath. To wit: a stream of neutral helium atoms--"an interstellar breeze," says Moebius--is flowing into the solar system right now. "It's coming from the direction of the constellation Ophiuchus. Because the atoms in the stream are uncharged, the magnetic bubble does nothing to stop them." Studying this stream is important because it can teach us a great deal about the heliosphere--How big is it? How leaky is it? It can also teach us about the interstellar "stuff" lurking just outside, says Moebius. Its temperature, 6000 C, is about the same as the surface temperature of the sun. 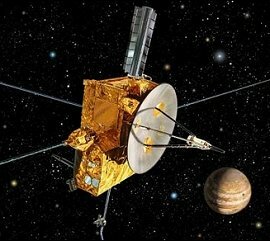 A spacecraft flying through the stream won't melt, though, or even notice the heat. The gas in the stream is too wispy-thin, explains Moebius. "There are only 0.015 helium atoms per cubic centimeter." Earth's atmosphere at sea level, for comparison, is a thousand billion billion (1021) times denser. And, finally, the velocity of the stream is 26 km/s or 58,000 mph. Most people think space is empty, but it's not. The "void" between the stars is crowded with clouds of gas. Clouds on Earth are miles wide. Clouds in space are light years across. They range in character from inky-black and cold to colorful and glowing-hot. Stars are born in clouds, and they hurl even more clouds into space when they die. 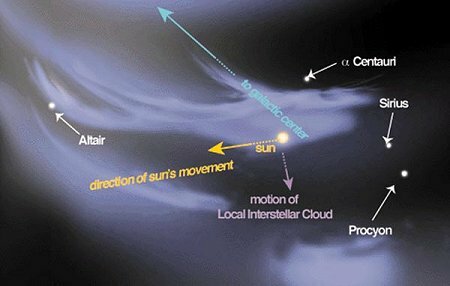 Interstellar clouds are everywhere, so it's no surprise that the solar system is running into one. This cloud, like most things in the Universe, consists mainly of hydrogen. We know this because the hydrogen absorbs telltale colors from the light of nearby stars. Astronomers use this absorption effect to trace the cloud's general outline: it is several light years wide and ragged-edged. 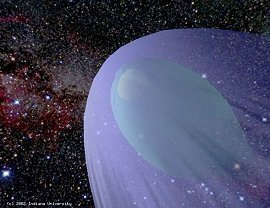 The cloud's abundant hydrogen doesn't easily penetrate the heliosphere because hydrogen atoms in the cloud are ionized by interstellar ultraviolet radiation. Like cosmic rays the hydrogen atoms are charged and, thus, held at bay. Helium atoms, on the other hand, are mostly neutral, so they slip into the solar system. Although helium is only a minor ingredient of the cloud, it tells the researchers what the whole is like. The cloud's temperature is 6000 C, the same as the helium stream. Its velocity, 26 km/s, is the same, too. If the cloud contains a standard cosmic mix of hydrogen and helium--a reasonable assumption--then its overall density must be 0.264 atoms per cubic centimeter. These numbers are important. They are vital to the size and "leakiness" of the heliosphere. The bubble is inflated from the inside by the solar wind and compressed on the outside by the cloud. It's a balancing act. If the pressure of the cloud (a function of temperature, density and velocity) is high, it defeats the solar wind and makes the bubble smaller, lowering our defenses against cosmic rays. Right: ISSI team-leader Eberhard Moebius of the University of New Hampshire. After that â€Ś who knows? Another cloud might come along compress the bubble again. The ISSI team's research, eventually, could tell us how the heliosphere will react. Shields up? Shields down? It's not science fiction any more.